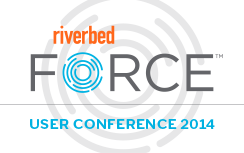 Riverbed FORCE is just a few weeks away, and with a large number of attendees from the prior OPNETWORK conference attending, I am excited to learn about the latest from SteelCentral! More specifically I am looking forward to learning about the latest in application and network performance management. What should you expect from the SteelCentral team at FORCE? Two of my favorite presenters, Gerald Combs and Hansang Bae will be presenting. Gerald is currently the Director of Open Source Projects at Riverbed and the original author of Wireshark source code! He started the Wireshark project in 1998 while working at an ISP. Hansang is currently the Chief Scientist at Riverbed. Hansang’s extensive background in network engineering – campus, branch, and datacenter architecture, gives him a unique perspectiveon network problem solving. Free education and free certifications! The Riverbed Certification Program recognizes those who demonstrate competency in the configuration, maintenance, and troubleshooting of the Riverbed product suite and platform. Both of the SteelCentral NPM and APM certificates are granted to individuals who demonstrate knowledge in the theory and configuration of the SteelCentral NPM and APM solutions and can conduct demos and proof of concepts on a given network. This is a great opportunity to grow your skills! Attend the hand-on lab using SteelCentral NetPlanner, NetProfiler, Packet Analyzer, Net Auditor, AppResponse and AppInternals. You will get real-world experience deploying and managing each solution. What’s great about these hands-on labs is that you do not need to install or configure in your own environment. Once you’re finished learning about the product functionalities you’ll be able to take this knowledge back with you to apply in your environment. You have an opportunity to meet one-on-one with SteelCentral product development and management teams. You’ll hear about product enhancements, as well as have the opportunity to voice your questions and challenges with NPM and APM. Hope to see you at FORCE to learn about the latest features and future of SteelCentral!